All beryls are heart-centred, and are calming and balancing. With this also comes a sense of analytical detachment, making them extremely useful in helping us step back from a problem in order to gain insight. Beryls have been used for thousands of years to treat injuries and diseases of the eyes, and to detoxify or remove poison from the body. Each variety has its own additional properties. Aquamarine promotes spiritual growth and psychic development, especially clairvoyance, as well as inner stillness and expansion. It can lift the spirits, helping us to feel happy and relaxed, yet without lethargy, so we are still goal-orientated and dynamic. It brings clarity in confusion, and helps us to organise our thoughts and ideas. Carried through from the Middle Ages, it is still believed to encourage us to ‘speak our truth’, without anger or unnecessary emotional fallout. It aids balance on all levels, including hormone, mood and energy balancing. On a physical level, it is detoxifying, supports the immune and autoimmune systems, and is particularly useful in the treatment of diseases of the thyroid. For centuries it has been purported to improve eyesight, and is still used in this manner today. Aquamarine crystal water (fresh, without preservative) can be used as eyewash to treat vision problems, infection, and diseases of the eye. Emerald supports and encourages spiritual growth and clairvoyance, and allows us to gain a sense of beauty and justice. It is detoxifying, supports the immune system, and balances on every level. Emerald strengthens communication and friendship, and bestows harmony, unity and cooperation. Through its balancing effect, it helps us to recover from misfortunes and dramatic changes in our lives, and inspires us to embrace optimism and joy. It is still used in modern crystal therapy to treat eye conditions and epilepsy. Goshenite encourages neutrality and the ability to stand back from conflict and challenge, so we can understand the true nature of that conflict and grow from the experience. Like aquamarine, it inspires us to ‘speak our truth’ from a position of strength and integrity, and without anger. 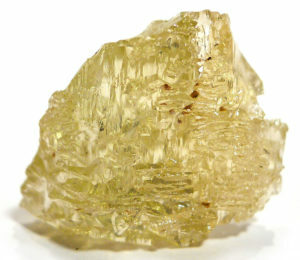 As with other beryls, goshenite calms and balances the autonomic nervous system, and can be worn in times of stress to help calm, and control panic attacks and stress-related illness. According to Melody, it can be used to open and activate the Crown Chakra. Like emerald, green beryl’s sparkly energy balances and harmonises on every level: emotional, hormonal, male-female, and even the left and right hemispheres of the brain. It first clears what is not wanted/needed, then stabilises what is, all the time dancing through us with a playful, fairy energy. It elevates mood, leaving us with a lighter, more optimistic outlook, and strengthens life force (or Chi), reminding us of the importance of fun and laughter. As with other golden minerals, heliodor is warming, bringing delight and joy; but it is subtler than most, as it stimulates ‘inner’ happiness that is more internal and detached, building self-confidence and allowing us to feel less dependent on others. It aids elimination of toxins, including in cases of food poisoning, and supports and treats filter and digestive organs, such as the liver, kidneys, gall bladder and pancreas. Morganite’s lovely, clear pink colour indicates that this is a heart crystal – but it is a heart crystal with a difference. 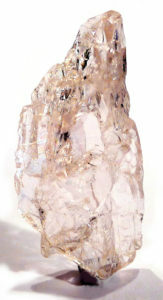 The detached quality of beryl means morganite teaches us to love without ego. This makes it an excellent stone for facilitators and practitioners, allowing us to love our clients and students without becoming attached to outcome or personally involved, and gifting us the ability to facilitate without our egos getting in the way. Judy Hall recommends its use for alleviation of stress and anxiety, especially by sitting in a morganite circle (that could be expensive!). Melody advises using it to clear and treat diseases of the lungs. Morganite has a powerful connection with the Angelic realm, but for me this connection is with the Overseers – the higher echelons of angels responsible for witnessing the bigger picture, the fate of the Earth and the Universe, and who rarely interact with the human realm. Unless you have been working with minerals for a while, you are unlikely to have heard of beryl, except possibly as the “elf stone” in Tolkien’s Lord of the Rings. However, most people will be familiar with its main gemstone varieties, such as aquamarine and emerald. It occurs as a minor constituent of many granites, and their associated pegmatites. 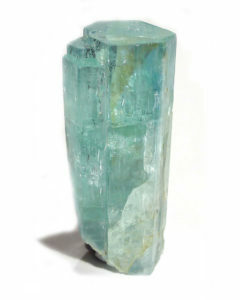 Beryl has not been found in large deposits, and most beryl production is a by-product of the mining of feldspar and mica. All beryls have the same chemical formula – the wide colour range is a result of included trace elements such as iron, lithium and chromium. Good quality crystals frequently display small rainbows, which can be an identifying factor. 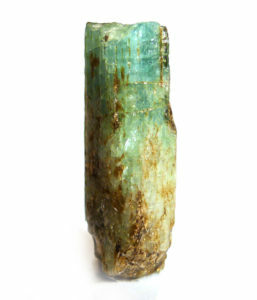 Common beryl, which is tan to pale green, blue or colourless, is a major source of the rare element beryllium, used to regulate the flow of neutrons in beryllium moderated nuclear reactors. Up until 1925, when this use was discovered, beryl was used exclusively as a gemstone. I have not listed Bixbite (red beryl), as most mineralogists no longer recognise it a separate variety of beryl. Interestingly, although a very old name, there appears to be confusion about its origin. One source (Schumann) says it comes from India; while two others (MinDat and Bonewitz) suggest it is from the Greek ‘beryllos’, referring to a variety of green stones. Neither provide an indication as to its meaning. Damigeron (2nd century BC) recommends drinking beryl crystal water to cure damage to the eye. Pliny the Elder also mentions its use (as crystal water and in powdered form) to treat eye diseases. Hildegard von Bingen suggests drinking beryl water to dispel ingested poison, and goes on to say that someone who wears, carries or holds beryl regularly will be tranquil and not dispute with others (true in my experience!). Beryl was worn in adversarial situations, such as battle or litigation, as it was deemed to render the wearer unconquerable, yet amiable, and to quicken the intellect as well as cure laziness (Arnaldus Saxo, c. 1220 AD. In Thomas de Cantimpré’s (1201 – 1270) Liber de Rerum Natura it was recommended for several medicinal purposes, including the treatment of swollen glands by rubbing it on the affected area. He also claimed it would rekindle love in married couples. 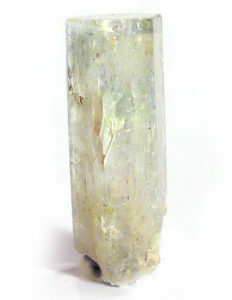 Beryl was a popular skrying stone in the Middle Ages. Most sources indicate that this was done through dowsing, attaching the beryl to a thread over a bowl of water, with the crystal just touching the water. The bowl would be marked with letters of the alphabet, and the pendulum would move towards these letters, in a similar way to a ouijia board. An alternative method involved throwing the stone into a bowl of water and reading the disturbance it created. According to Kunz, the first crystal balls were made of beryl, before clear quartz became more popular. However, this assumption was probably due to a corruption of the low Latin word for magnifying glass, beryllus, which may have been applied to anything clear that enabled one to see – including glass.